Did you grow up in a small town? Its often thought to be an idyllic situation – a small town where everyone knows your name, where familiar faces are always around and traditions of the season are shared as a community. I’ve always liked small towns – although sometimes its hard to break through since you’re the outsider. 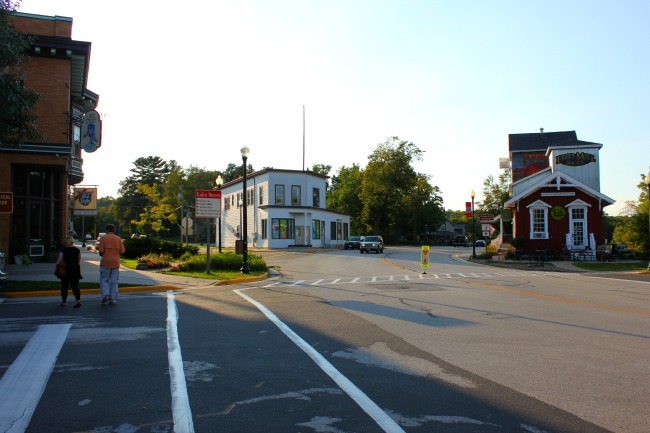 As the visitor, the tourist, the traveller, you stand out – and I certainly did stand out in small town Elkhart Lake, Wisconsin. I was a curiosity – as I wandered around taking photos. I knew I looked like a tourist, but I also knew that I seemed even more strange since I was by myself and taking more photos than the normal visitor. Despite my failure to blend in, it became my advantage. People would talk to me, curious about what I was photographing, and I met as many visitors as much as I met locals, both eager to share their opinions and suggestions of Elkhart Lake. I found out about the Tuesday Night Drinking Club for guys and the wine club of women forming at a new wine store, Vintage Elkhart Lake Wine Shop and Tasting Bar. Locals told me when to go for a swim – late afternoon in September in Lake Elkhart was a great way to end the day – and where to go for a coffee and breakfast – at Off the Rail, located in the heart of the downtown in the old railroad building. I realized why small towns have so much allure – for those independent places that can only exist there. There doesn’t need to be a lot of choice – if this is the place, this is the place to go to. So despite my status as a newbie, foreigner or tourist, curiosity and a smile welcomed me in like someone becoming a local.